The LaserJet 4M Plus is identical to the 4Plus except that it is Macintosh compatible, and has a JetDirect network card. The HP LaserJet 4M plus is a classic mid-sized workgroup or personal printer. No longer available. The 4M Plus includes an additional 4MB of memory (6MB total), a Postscript Simm card, and a JetDirect network card. The HP LaserJet 4M plus is a classic mid-sized workgroup or personal printer. You get a lot of printer for the money. I use a 4 Plus in my own home office. These babies were built to take-a-lickin' and keep on tickin'. 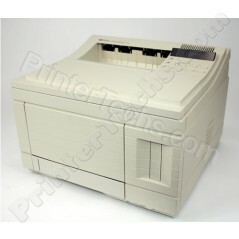 To find this kind of reliability in a new laser printer you would have to spend two to four times the money. No longer available.